This is a slightly different post than I normally do. Although it’s not really relevant to education businesses per se, I spend a lot of time reading about successful entrepreneurs and those at the top of their respective industries. Even when all the odds were stacked against him, he’s managed to rise to the very top – hopefully there’s a lot you can learn from his journey that can be applied to your education business too. And that’s how the amazing life of Gordon Ramsay got started. Once the cooking began, things took a dramatic upswing. 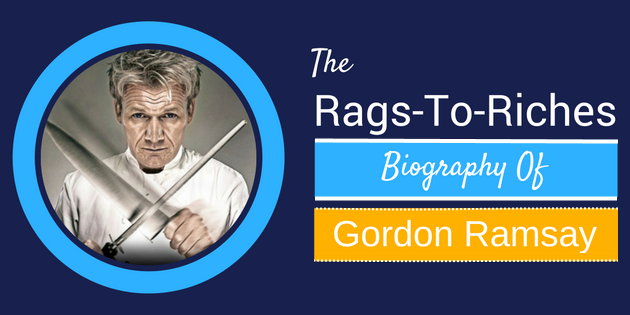 In fact, he was the first Scottish chef to win three Michelin stars (he now has 16 to his name); he’s been awarded the Order of the British Empire (OBE) by the Queen, and he owns restaurants in Dubai, Tokyo, New York, London, Ireland, Los Angeles, Montreal, and other top locations. And that’s just from his success as a chef! Oh, and he’s also a marathoner and an Ironman competitor, and a husband and father to four kids. Whew!